Thank you for the valuable info. I have a Hamilton Kirk which was given to my great uncle in 1952 for 25 yrs of service at Shell. It is inscribed on the back with the year, Shell and my uncles name. I would never sell it, but I am curious about it's value. It does not run, but the inside guts are shinny. After reading your article, I'm thinking about getting it restored. 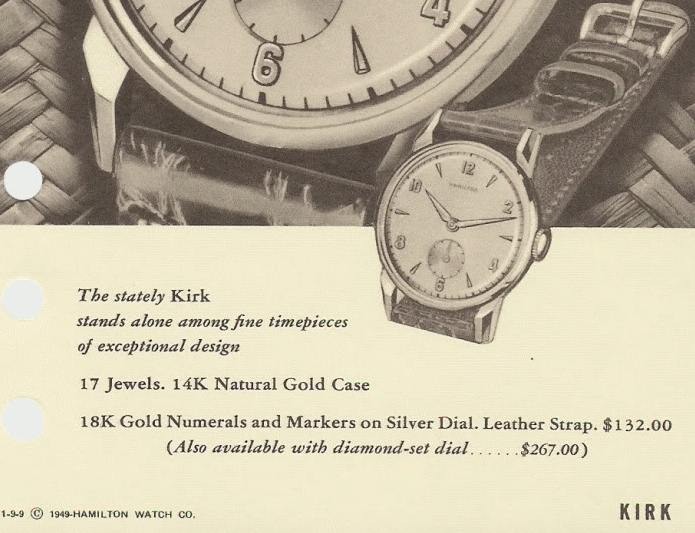 I’m sure you could find a Kirk for $500 or thereabouts. Getting it overhauled is a good idea if you want to wear and enjoy it. If it’s just for display or storage then it doesn’t matter. I carried my grandfather’s pocket watch in a cookie tin for 25 years before getting it fixed. That’s what started me on this hobby so be forewarned, if you get your Kirk fixed you will probably want another and another. Thank you HandyDan! Your response is much appreciated. I doubt I would wear it (I'm not a watch wearer) But, this watch was handed down to my dad and he wore it for years, until it broke. I guess either he or my mom were tired of looking at the same watch...lol. My dad passed away 11 years ago, so I cherish it and keep it in a little decorative bag in my purse. If I got it repaired or cleaned it up, I worry it would take the remains of my dad's energy with it. Holding it gives me comfort. Anyway, thank you again! Ps: It was so suprising to see how shinny and pristine it was on the inside!